Highlights the European discovery, conquest, and exploration of the Americas. Amérique Historique, Physique et Politique Actuelle. This is a c. 1835 Emmanuel, Comte de Las Cases and Paul Renouard map of the Western Hemisphere. The map depicts the entirety of North, Central, and South America, along with the Caribbean Sea and part of the Pacific and Atlantic Oceans. The discovery, conquest, and exploration of the Americas is highlighted , beginning with Christopher Columbus's transatlantic voyage in 1492 when he landed on Hispaniola. Fernando Cortez's march through Mexico and subsequent conquest of the Aztecs is also illustrated and highlighted in yellow, traveling from Cuba to Mexico City. Pizarro's conquest of the Inca Empire in Peru is also traced. One expedition after the Age of Conquest is illustrated as well, Lewis and Clark's harrowing expedition through the Louisiana Territory to Washington, where the settlement at Astoria is labeled. Each country is labeled and includes the number of inhabitants and the number of square miles of territory it controls in most cases. Cities and towns are labeled as well throughout the hemisphere. Captions inform the viewer of facts throughout the hemisphere as well, such as the fact that the Amazon was still pretty much unknown territory and that the Mississippi is the second longest river in the world. 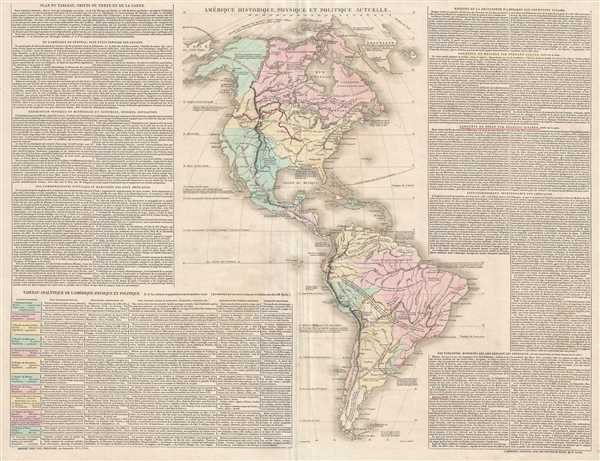 Text frames the map on nearly three sides, containing information about the hemisphere in general and about the expeditions of Columbus, Cortez, and Pizarro, along with a paragraph concerning the American Revolutionary War. A table of information about most of the countries in the hemisphere is also included and situated on the lower left. This map was drawn by Emmanuel, Comte de Las Cases, engraved by Alexandre Moisy and the lettering was engraved by Bénard. It was published by Paul Renouard in Las Cases' Atlas historique c. 1835. Emmanuel-Augustin-Dieudonné-Joseph, comte de Las Cases (June 21, 1766 - May 15, 1842) was a French historian and atlas maker. Born at the family's castle near Revel in Languedoc, Las Cases was educated at military schools in Vendôme and Paris. He then entered the navy where he saw action during the years 1781-82. He was forced to flee France during the French Revolution, and spent several years in Germany and England. He took part in the Quiberon Expedition in 1795 (an invasion of France on the Quiberon peninsula by émigré ,counter-revolutionary troops in support of the Vendée Revolt) that was soundly defeated by the Republican army. Las Cases was one of the few to return to London alive. In 1801 he published the first edition of his Atlas Historique under the pseudonym A. Lesage. Upon his return to France after the Peace of Amiens in 1802, Las Cases published the first French edition of his atlas in 1803-1804 called the Atlas historique, généalogique, chronologique et géographique de A. Lesage. Las Casas returned to France during the Consulate and, with other royalists, rallied to the side of Napoleon Bonaparte. Las Cases would support Napoleon throughout his reign, and was eventually made a chamberlain and then a count of the empire. After the first abdication in 1814, Las Cases again fled to England, but returned to Napoleon's side during the Hundred Days. After the defeat at Waterloo, Las Cases was the one who suggested Napoleon throw himself at the mercy of the British Empire and later accompanied him to Saint Helena. It was on Saint Helena where Las Cases acted as Napoleon's secretary, taking detailed notes of their conversations. These notes were then published in book form following Napoleon's death as Le Mémorial de Sainte-Hélène, which is remembered as a less-than-neutral account of Napoleon's time on Saint Helena. Alexandre Moisy (1763 - c. 1827), also known as Claude Alexandre Moisy, was a French engraver. Born in Paris, Moisy was a prolific engraver who worked on numerous projects, several of which were books. Some of the texts that he contributed engravings to include Voyage picturesque de la Syrie, de la Phénicie de la Palestine, et de la Base Égypte by Louis Françpis Cassas and published in 1799 and Les ruined de Paestum by Claude Mathieu Delagardette published in 1798. Moisy also engraved all the plates for the book entitled Les Fontaines de Paris, Anciennes et Nouvelles, for which he drew all the engravings and also served as the editor. Paul Renouard (1803 - 1871) was a French printer and publisher. He was the third son of the famous Parisian bookseller Antoine-Augustin Renouard. He was active in the book printing and publishing worked until 1849 when he retired and began a career in the foreign service in Asia. Las Cases, E. Atlas historique, généalogique, chronologique, et géographique (Paris: Paul Renouard) 1827. Originally published as the Geneaological, Chronological, Historical, and Geographical Atlas under the pseudonym A. Lesage by Emmanuel, Comte de Las Cases in 1801 during his exile from France caused by the French Revolution. Las Cases then published the first French edition, entitled Atlas historique, généalogique, chronologique, et géographique in 1803. Numerous subsequent editions were published in French, Russian, Italian, and German through approximately 1850. Very good. Even overall toning. Verso repair to centerfold separation. Minor closed margin tears professionally repaired on verso. Blank on verso.